This PDF 1.5 document has been generated by Adobe InDesign CS5.5 (7.5) / Adobe PDF Library 9.9, and has been sent on pdf-archive.com on 09/06/2016 at 19:46, from IP address 75.73.x.x. The current document download page has been viewed 1066 times. File size: 2.2 MB (36 pages). Products for Sale in Africa, Europe, Middle East and United States only. procedure is responsible for determining and using the appropriate technique in each patient. Caution: Federal law restricts this device to sale by or on the order of a physician or practitioner. 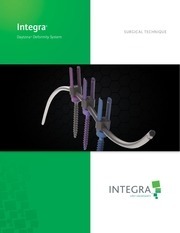 familiar with the implant system components before proceeding. minimal instruments, eight of which are multifunctional. Surgeons agree; the simpler the instrumentation and fewer implants, the easier it is on the surgeon, support staff, and patient. may be rigidly locked together in a variety of configurations to promote fusion for a wide variety of patient anatomies. 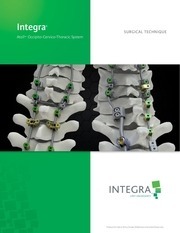 Spinal System with the use of transitional rods and rod connectors. certain metabolic disorders affecting osteogenesis. 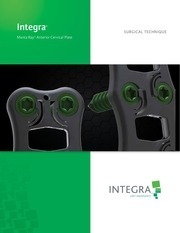 •	Insufficient quality of bone, which would inhibit rigid device fixation. •	Previous history of infection. •	Any neuromuscular deficit, which places an unusually heavy load on the device during the healing period. of the fixation of the device or to failure of the device itself. 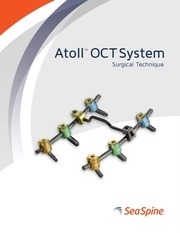 •	Patients having inadequate tissue coverage of the operative site. diseases, elevation of white blood cell count (WBC), or marked left shift in the WBC differential count. decision. The above list is not exhaustive. •	Polyaxial “friction head” screws. 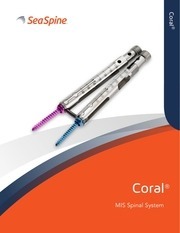 •	Two screw diameter options: 3.5 mm and 4.0 mm. virtually eliminates the possibility for cross threading. 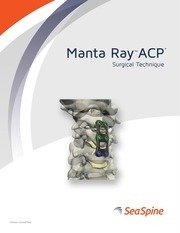 Prepare the patient using a standard surgical approach. prevent displacement of the drill bit during initial insertion. drill to be used for preparation of variable depths. clockwise until the step of the drill shaft contacts the guide. well as to help determine proper screw length. bone is felt at the distal end of the path. as to help determine proper screw length. drill hole until the tip contacts the bottom of the hole. of the screw sizing slot. Tapping is optional since the screws have a self-tapping starter tip. screw diameter and are available for the 3.5 mm and 4.0 mm screws. the surgeon is having difficulty starting the self-tapping screw. shaft step contacts the guide. and diameter determined, the screw is prepared for insertion. This file has been shared by a user of PDF Archive. Document ID: 00383074.